Increasing eruption at Anak Krakatau ... ? En la monitorización de la emisión visible y difusa de los volcanes se ha encontrado que ésta varía con la presión atmosférica, salvo, repito, salvo, cuando el volcán está activo o entra en actividad. Es decir, en ausencia de actividad, la presión atmosférica permitira una mayor o menor liberación de gases, pero en actividad, le importa un bledo la presión atmosférica. Si un mínimo solar pudiese afectar en esa medida a la presión en la litosfera, que haría en nosotros, pobres y humildes masas de agua !! Personalmente solo lo he notado con diferencias de 300mb, haciendo noche a 3500m de altura. Literalmente, explotaba. Pero... ¿de cuantos mb de diferencia hablamos en un mínimo solar? lo que puede llevar consigo un aumento de actividad vulcanológica en plumas cercanas a las zonas de subducción. A significant seasonality is found in the occurrence time of past great earthquakes (M ≥ 7.9) in the northwestern margin of the Philippine Sea plate. Among the thirteen earthquakes cataloged, five took place in December, and all the earthquakes are included in the seven months from August to February. The probability that such a skewed distribution occurs by chance is as small as 2.0%. This seasonal concentration of earthquakes suggests that a small stress increase may trigger an earthquake when the future focal zone is at a critical condition to release a large rupture. As a candidate factor of the earthquake triggering, we tested a possibility of stress change caused by annual variation of the atmospheric pressure. However, the incremental stress is no larger than 30 Pa, and it hardly accounts for the seasonality of the great earthquakes. Perdóneseme la ignorancia, pero no entiendo la relación entre la temperatura y la variación de presión para una misma masa de aire. Tan solo la entendería si la masa gaseosa que rodea la tierra tuviera una limitación por la que a mayor temperatura conservara su volumen, entonces si se daría el caso de una mayor presión. Pero si en este foro se ha hablado de la capacidad de la atmósfera de contraerse o expandirse según la temperatura y la masa permanece invariable, la presión por lo tanto debiera ser constante. The orbital decay of a low-Earth-orbit satellite having constant cross-sectional area in a near-circular orbit can furnish valuable information regarding the dynamical conditions of the atmosphere. The slope of the orbital decay curve gives the atmospheric density, whereas the curvature of the decay curve can indicate the expansion, stability or contraction of the atmosphere. The state of the atmosphere in 1994 was determined from the orbital decay of the ODERACS I spheres by employing this technique. The state of the atmosphere in 1995 was determined from the orbital decay of the ODERACS II spheres and reported in this study. From days 40–215, 1995, the atmosphere was in a prolonged compression mode. During this period, ODERACS II Sphere 3 encountered progressively smaller densities as the density scale height diminished steadily. This was followed by a period of relatively stable atmosphere. During a brief period from days 280–300, the atmosphere was in a strong expansion mode, which was followed by another compression mode until day 360. The results show great parallels between the atmospheric conditions in 1994 and 1995, including clear indications of the semi-annual variation. The atmosphere in 1995 was under greater compression than in 1994, consistent with the phase of the sunspot cycle. However, the rate of atmospheric contraction was greater in 1994 than in 1995 in contrast to predicted models. The observed 10.7 cm solar fluxes at Penticton, British Columbia, strongly support the findings of this study. The motion of a satellite in orbit, subject to atmospheric force and the motion of a reentry vehicle are governed by the same forces, namely, gravitational and aerodynamic. This suggests the derivation of a uniform set of equations applicable to both cases.For the case of satellite motion, by a proper transformation and by the method of averaging, a technique appropriate for long duration flight, the classical nonlinear differential equation describing the contraction of the major axis is derived. While previous authors, and in particular King-Hele, integrated this equation using various heuristic methods, the present authors present a rigorous analytic solution, with a high degree of accuracy, using Poincare's method of small parameters. Next, using Lagrange's expansion, the major axis is expressed explicitly as a function of the eccentricity. The solution is uniformly valid for moderate and small eccentricities. This is a major achievement due to the discovery of a certain recurrence formula which facilitates the long and tedious analytic process. For highly eccentric orbits, the asymptotic equation is derived directly from the general equation. To obtain the same equation King-Hele must use an entirely different method. Again, while King-Hele only succeeded in obtaining an approximate solution to this case using a heuristic method of integration, the exact solution to the asymptotic equation has been obtained by the present authors. Numerical solutions have been generated to display the accuracy of the analytic theory.The explicit solution has been derived using a spherically symmetrical atmosphere with exponential variation of density with height but the basic equations developed and the technique for their integration apply to the case of an oblate atmosphere which is locally exponential. y quizás, en esa situación de transición, de inestabilidad, de reequilibrio, es cuando se produce un aumento de la natural actividad sísmica y vulcanológica. The breathing-like activity is the result of high-speed solar wind disturbances that cause a recurrent expansion and contraction of Earth's atmosphere every few days, satellite observations show. This atmospheric mode could affect radio communication, orbiting satellites and possibly the Earth's climate, researchers say. This breathing of the atmosphere can also lead to changes in the composition of the ionosphere, which ranges from the upper portions of the mesosphere (just below the thermosphere) to the exosphere. These changes have implications back on Earth's surface, because "the ionosphere affects all kinds of radio operations," said study team member Geoff Crowley, president and chief scientist at Atmospheric & Space Technology Research Associates (ASTRA) LLC in San Antonio, Texas. The changes in heating that cause the breathing can also impact climate, by triggering the upper atmosphere's "thermostat," as study team member Martin Mlynczak of NASA's Langley Research Center, Hampton, Va., put it. The added UV radiation heats up the atmosphere, in turn causing gaseous molecules to radiate that heat away in the form of infrared radiation. The Contraction of Satellite Orbits under the Influence of Air Drag. Part 7. Orbits of High Eccentricity, with Scale Height Dependent on Altitude. New satellite observations have revealed a previously unknown rhythmic expansion and contraction of Earth's atmosphere on a nine-day cycle. This "breathing" corresponds to changes in the sun's magnetic fields as it completes rotations once every 27 days, NASA and University of Colorado, Boulder, scientists said Monday at the American Geophysical Union annual meeting. The scientists used changes in the density of the Earth's atmosphere to pinpoint this previously unknown pattern. As the atmosphere contracts or expands, it also gets more or less dense, respectively. In response to the "hills and valleys of density," satellites subtly speed up or slow down, recording those motions with on-board accelerometers. And that's the data that allowed the scientists to back into the discovery of this new atmospheric cycle. Tectonics, volcanism, and climate on Venus may be strongly coupled. Large excursions in surface temperature predicted to follow a global or near-global volcanic event diffuse into the interior and introduce thermal stresses of a magnitude sufficient to influence widespread tectonic deformation. This sequence of events accounts for the timing and many of the characteristics of deformation in the ridged plains of Venus, the most widely preserved volcanic terrain on the planet. Tilt and strain measurements are collected in a cave at a depth of 60 m in the Friuli seismic area (NE-Italy) where the topography suddenly reaches a height of 600 m a.s.l. The data are analysed to find a possible correlation between crustal deformations on one side and precipitation and barometric pressure variations on the other. Once the significance of the correlation is established, an attempt is made to give a physical explanation of the detected correlation in the frame of the elasticity theory. A significant areal reduction in strain observations occurs together with a marked rotation of the principal axes in the horizontal plane at the time of rainfall events while no evident signals are revealed in the tilt components. The atmospheric pressure has small influence on the tilt–strain observations, when compared with the effects of rainfall and consequent underground waterflow: referring to large perturbations, atmospheric pressure appears to influence the areal deformations in terms of about 1 nstrain per mbar, an order of magnitude less then that of the hydrologically induced deformation rate, which reaches up to 600 nstrain (in about 1 day) per 120 mm/day rainfall. The history of the southern central Andes, including the world's second largest plateau and adjacent intermontane basins and ranges of the Eastern Cordillera and the northern Sierras Pampeanas of Argentina and Bolivia, impressively documents the effects of tectonics and topography on atmospheric circulation patterns, the development of orographic barriers, and their influence on erosion and landscape evolution at various timescales. Protracted aridity in the orogen interior has facilitated the creation and maintenance of the Puna-Altiplano plateau. Contraction and range uplift, filling of basins, and possibly wholesale uplift of the plateau increased gravitational stresses in the orogen interior, which caused the eastward migration of deformation into the foreland and successive aridification. The uplift of the Andean orogen has also had a far-reaching influence on atmospheric and moisture-transport patterns in South America. This is documented by the onset of humid climate conditions on the eastern side of the Andes in late Miocene time, which was coupled with the establishment of dramatic precipitation gradients perpendicular to the orogen, and changes in tectonic processes in the Andean orogenic wedge. Severe aridity, hence low erosion rates, helps to account for the elevated volcanogenic contractional arc and high, internally draining plateau in its rain shadow. Weak erosion along the north-central arc provides scant amounts of sediment to the Chile–Peru Trench, starving the subduction channel. Subcrustal removal might be expected to reduce the crustal thickness, but is not a factor at 25° south. The thickness of the gravitationally compensated continental crust cannot reflect underplating and/or partial fusion of sediments, but must be caused chiefly by volcanism-plutonism and contraction. Contrasting climate typifies the terrane at 45° south where moisture-laden westerly winds encounter a cool margin, bringing abundant precipitation. Abstract-The Easter and Juan Fernandez microplates, two counterclockwise-rotating microplates along the East Pacific Rise, are considered to be driven by downwelling tectonic vortices, as explained by a more recent geophysical theory known as the surge tectonic hypothesis. These twin microplates underlie the high-pressure cell of the Southern Oscillation associated with El Nino. The Central Pacific Megatrend connects planetary-scale tectonic vortices underlying the El Nino Southern Oscillation (ENSO) pressure cells. It connects the East Pacific Rise across basin to the Banda Sea tectonic vortex. The Banda Sea is a triple-plate junction (between the Australian, Pacific, and Southeast Asian plates) just north of Darwin and is considered an upwelling mantle vortex underlying the low-pressure cell of ENSO. Active surge channels, or geostreams, defined by the newer surge model link these planetary-scale tectonic vortices. The original lead for a trans-Pacific megatrend was from the works of the late A.A. Meyerhoff. He brought attention to this region with the publication of Surge Tectonics: A New Hypothesis of Earth Dynamics [1, 2]. His insight was based on many years of field study for oil exploration in Southeast Asia, the former USSR, and China, as well as on his background in fluid dynamics. 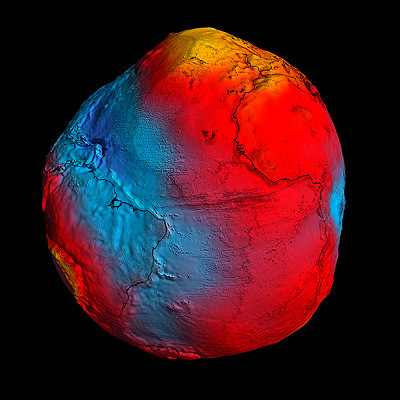 In addition, high-pass-filtered satellite altimetry data from the Geodetic Earth-Orbiting Satellite (GEOSAT) reveal across-basin trends in the gravity geoid. Esta ves es Jeff Masters el de WeatherUnderground el que nos dá un articulo interesante sobre la relación de los volcanes y el clima. Although carbon-based lavas, known as carbonatites, are found throughout history, the Oldoinyo Lengai volcano, located in the East African Rift in northern Tanzania, is the only place on Earth where they are actively erupting. The lava expelled from the volcano is highly unusual in that it contains almost no silica and greater than 50 percent carbonate minerals. Typically lavas contain high levels of silica, which increases their melting point to above 900°C (1652°F). The lavas of Oldoinyo Lengai volcano erupt as a liquid at approximately 540°C (1004°F). This low silica content gives rise to the extremely fluid lavas, which resembles motor oil when they flow. A team of scientists from University of New Mexico, Scripps Institution of Oceanography at UC San Diego and Centre de Recherches Petrographiques et Geochimiques in Nancy, France, report new findings of volcanic gas emissions in a paper published in the May 7 issue of the journal Nature. "The chemistry and isotopic composition of the gases reveal that the CO2 is directly sourced from the upper mantle below the East African Rift," said David Hilton, professor of geochemistry at Scripps Institution of Oceanography at UC San Diego and coauthor of the paper. "These mantle gases allow us to infer the carbon content of the upper mantle that is producing the carbonatites to be around 300 parts per million, a concentration that is virtually identical to that measured below mid-ocean ridges." Oldoinyo Lengai, like all volcanoes, emits carbon dioxide into the atmosphere as a gas. However, Lengai's magma is unusual in that it also contains high sodium contents. About one percent of the mantle-derived carbon emitted from Lengai goes into the carbonatite melt with the remainder being emitted into the atmosphere as CO2 gas. The CO2 released into the atmosphere by volcanoes worldwide is a small fraction when compared to man-made emissions.